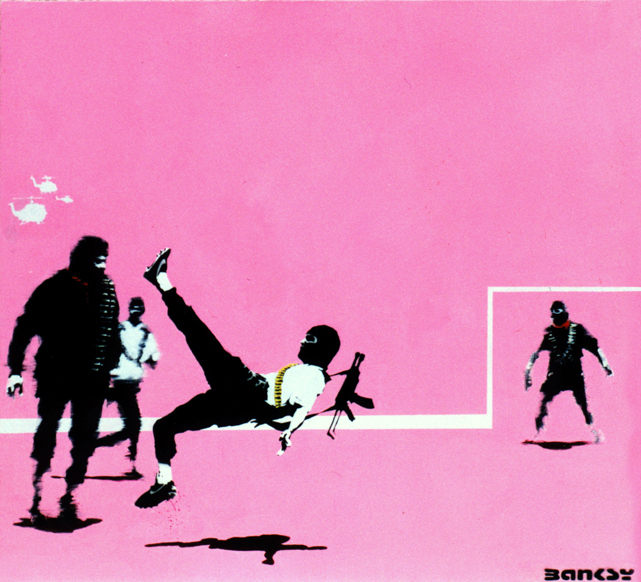 Banksy and Inter Milan vs. the Zapatistas; Brazil vs. an insane Chechen warlord; the many guises of Ronaldo; and more. Five bizarre happenings from the world of Latin America-related football. 1. Ronaldinho’s name means “Little Ronaldo”. The buck-toothed genius adopted this diminutive suffix in order to distinguish himself from Brazil’s other Ronaldo – the three-time FIFA World Player of the Year, who retired back in February. Confusingly, this Ronaldo was also once known as Ronaldinho, because there was already another older Ronaldo in Brazil’s 1994 World Cup squad. He played with the name Ronaldinho on his shirt again during the 1996 Olympics, due to the presence of yet another Ronaldo – this time centre back Ronaldo Guiaro – in the Brazil team. 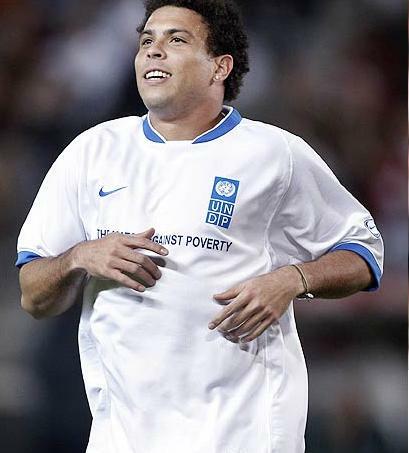 Nowadays he’s variously referred to as “Fat Ronaldo” or “Brazilian Ronaldo”, in order to avoid confusion with Portugal’s Cristiano Ronaldo, who is best known as a smug wanker. 2. Athletico Madrid striker Sergio “Kun” Agüero may be father to the world’s most talented two-year-old. * In February 2009, he had a child with Diego Maradona’s daughter Giannina Maradona. While old, coke-snorting, gun-toting Diego is considered by many to be the world’s greatest ever player, Agüero isn’t bad himself (as anyone who played Pro Evo 09 should know). Athletico are looking to raise up to £50 million should they be forced to sell him in the summer. And if his son Benjamín has inherited his grandfather’s infamous “Hand of God” then England better be wary of him roundabout the time of the 2030 World Cup. *For more father-son footballing banter, see Robin Van Persie get merked by his kid here. 3. Honduran midfielder Wilson Palacios’ playing career in England unfolded amidst a family hostage crisis. In October 2007 Wilson’s brother Edwin, aged just 14 at the time, was kidnapped at gunpoint from the family home in La Ceiba. His family paid over £300,000 in ransom money for his release, but Edwin remained in captivity. Wilson played with this hanging over him for two and a half years, yet his solid performances for Wigan Athletic and Tottenham Hotspur betrayed no sign of the strain he was under. The tragedy concluded when police in Honduras discovered Edwin’s body in May 2009. He was honoured a year later in South Africa, when Honduras made history by naming the three surviving Palacios brothers in their World Cup squad. 4. 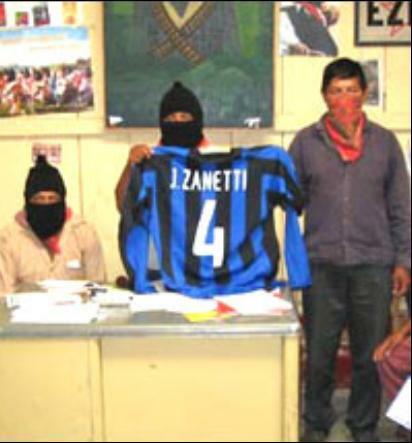 Inter Milan captain Javier Zanetti is an outspoken supporter of the Zapatista movement in Southern Mexico. The Argentine fullback has visited their autonomous communities in Chiapas, while his club Internazionale has sent football equipment and other supplies to aid the Zapatistas in their revolution. The mysterious rebel spokesman Subcomandante Marcos even challenged the Nerazzurri to a friendly against a Zapatista eleven, but sadly the tantalising prospect of Inter playing a team of balaclava-clad guerrillas never transpired. 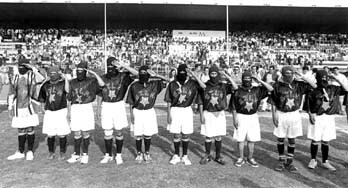 But this would not have been the first run-out for the EZLN FC. Back in 1999, way before the likes of Brad and Angelina were fawning over his work, anonymous graffiti artist Banksy also popped over to visit the autonomous communities. After painting a few murals he went one better than Zanetti and actually gave the Zapatistas a game. Playing for Bristol based anarchist club, the Easton Cowboys, Banksy was part of the first European team to travel to Chiapas. The Cowboys took part in a series of tournaments against the Zapatistas, and have since raised over £100,000 to provide clean water for the local people. 5. In an equally unlikely kick-around, members of Brazil’s World Cup winning squads from 1994 and 2002 recently took on a Chechen side led by warlord-turned-President Ramzan Kadyrov. This surreal match-up took place just three weeks ago in Grozny. The Brazilian side included Romário, Cafu, Dunga, Denílson and legendary left-back Roberto Carlos, who recently signed for Russian club Anzhi Makhachkala in neighbouring Dagestan. The ever-so-slightly less glamorous Chechen team was comprised of various Soviet ringers, German midfield veteran Lothar Matthaeus and Dutch ace Ruud Gullit, who for some reason (lots and lots of oil money?) is also Terek Grozny’s current manager. As if the story needed another bizarre subtext, Ramzan Kadyrov’s father was blown up by terrorists in the very same stadium in 2004. With teammates, opponents and even the referee all keen to gift him scoring opportunities, the maniacal host missed two penalties before eventually netting with a tap-in and converting a third spot-kick. Ultimately, despite their best efforts to throw the tie, Brazil’s old boys emerged victorious in a shambolic 6-4 thriller.